Bernie Sanders’ campaign has filed suit against the Democratic National Committee after they were suspended from access to the party’s voter database. The database is being used by all three campaigns, with each campaign adding their own voter data. A breech in the system led to members of Sanders’s campaign improperly obtaining access to information from the Clinton campaign. While the actions of the staffers involved do appear to be wrong, the incident does demonstrate differences between how Sanders and Clinton respond to ethical questions. The Bernie Sanders campaign staffer who was fired for accessing data unique to the Hillary Clinton campaign’s vote file, told CNN on Friday that he was only trying to “understand how badly the Sanders campaign’s data was exposed” and not attempting to take data from the Clinton campaign. The Sanders campaign fired Uretsky over the breach. “That behavior is unacceptable and that staffer was fired immediately,” Sanders’ spokesman Michael Briggs said Thursday night. It is impossible to know if Uretsky was being honest about his motives. Due to the questions caused by his actions, the Sanders’ campaign was right to immediately fire Uretsky. The Sanders’ campaign had been threatening to file suit throughout the day on Friday after they were subsequently denied access to their voter data on the sever by the DNC, and ultimately did file suit late Friday afternoon. The DNC’s punishment is a potentially crippling blow to the Vermont senator’s campaign: it means he temporarily loses access to critical voter data just weeks before voting is set to begin in Iowa and New Hampshire, where he is within striking distance of Clinton. Without access to the voter file, on-the-ground organizing will become far more difficult for Sanders. 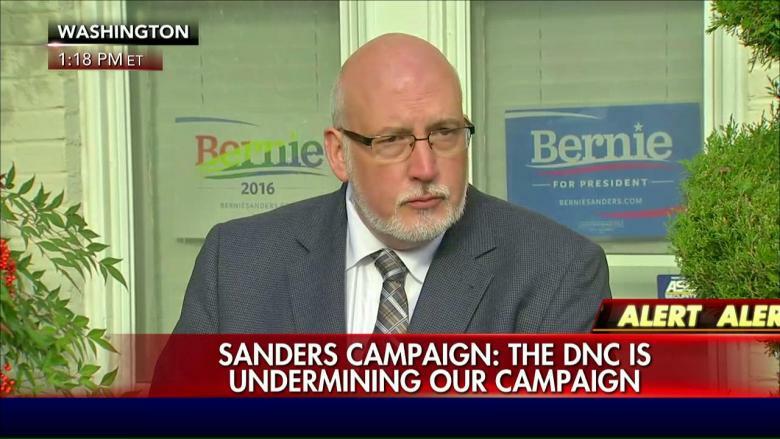 This also hinders fund raising efforts, and the Sanders campaign is suing for damages. Democracy for America, which endorsed Sanders the previous day, and Move On have both defended Sanders and called on the DNC to allow his campaign access to their data. The rather extreme manner in which the DNC handled the situation has exacerbated tensions in the Democratic Party due to the manner in which DNC Chair Debbie Wasserman Schultz, a long-time Clinton ally, has used her position to favor Clinton. This includes both the limiting the number of debates allowed, as requested by the Clinton campaign, which only wanted a total of four debates, along with scheduling the debates at times they were less likely to be viewed–such as this Saturday night. While the improper actions of staffers does not reflect well on Bernie Sanders, sometimes it takes a crisis to show the true character of the candidates. There was a considerable difference between the reaction of the Clinton campaign to this matter and how Bernie Sanders desired to keep the Clinton email scandal out of the Democratic debates. It is debatable whether Sanders made the right decision considering the far more serious nature of the scandals surrounding Hillary Clinton. Considering the number of supporters who question voting for Hillary Clinton if she wins the nomination, it might be prudent for Clinton to support Sanders’ right to access to his voter information to avoid further alienation of progressive voters. Clinton press secretary Brian Fallon has not been helping her campaign by attacking Sanders on Twitter over this. Except that if it was the Clinton camp, they [probably would not have notified the vendor of the security vulnerability as the Sanders camp did, they probably would not have fired the individual responsible, and they would have come up with a series of lies to justify their actions as they were exposed by fact checkers of doing regarding the email scandal. While it is unfortunate that such a crisis has developed during the campaign, there is the risk of scandal in any campaign. There is also the risk of scandal during a presidency. Sanders actions suggest that he would respond to a scandal in his administration far more honorably than Clinton would. Is there any doubt that any crisis in another Clinton administration would lead to endless stonewalling, dishonesty, and attacks?